A few months ago Elliott was watching me play around on illustrator and he said "make me!" so I did. I made a shape that had some of his characteristics and added legs. He requested I make more of other people he loves and before we knew it we had a whole family of shapes! Thus, the Shapelys were born. I kind of love them, so don't be surprised if you see them pop up in other projects down the road. 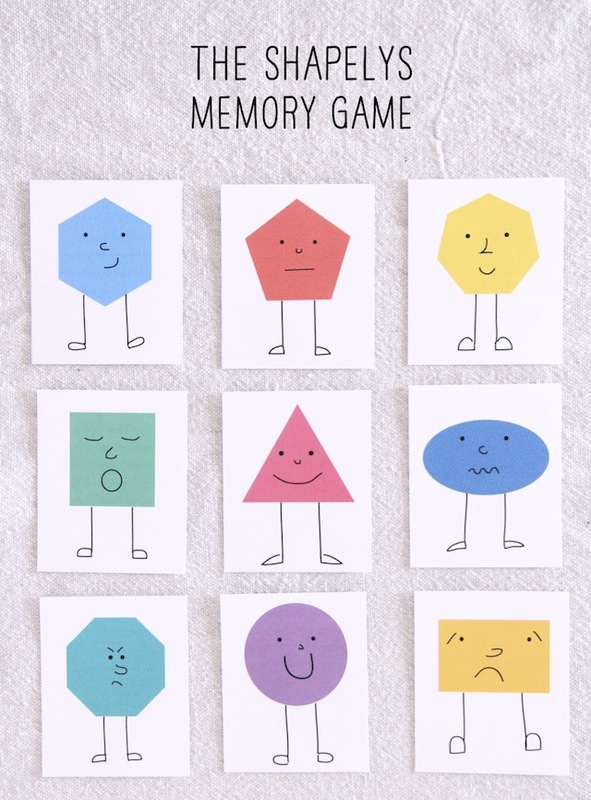 It being the holidays and all, I thought it would be fun to turn the family into a memory game! Perfect for stocking stuffers, don't you think? All you have to do is print them out (here), then print the polka dots on the back (here), cut and play. Be sure to print them out twice so you have pairs to play with. You could even laminate them for extra protection from little hands! I hope you love these little guys as much as we do! Wrap them up with some twine and they are ready for gifting! In case you missed it, you can download the Shapelys here and the polkadot backside here.